This past weekend, I took on a turn on the cooking stage at the Salt Lake Home Show. As I hung out backstage, prepping for my Cooking Light with Flavor demonstration, I listened in on the mock-Chopped competition playing out on stage. Just like in the Food Network show of the same name, the competitors were challenged to cook a dish with the surprise ingredients. What was in their basket? A nightmare combination of ingredients! 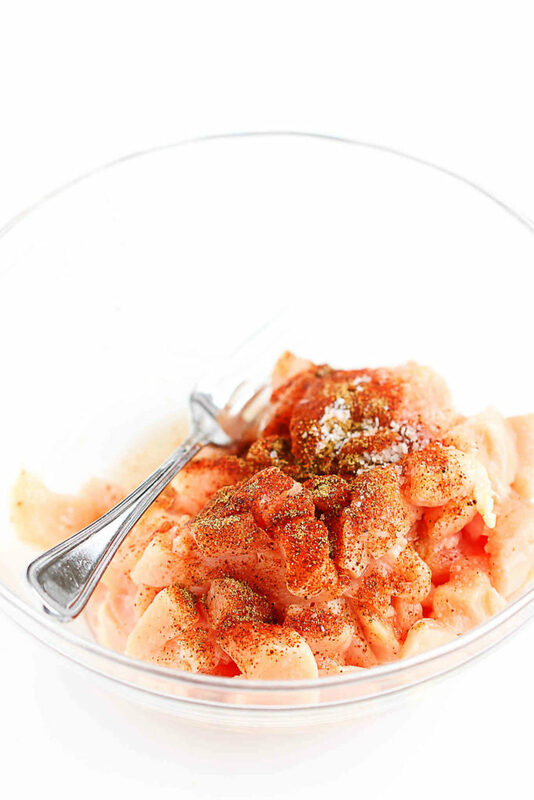 Tilapia, melon and licorice. Holy cow! If I was on stage, that basket of ingredients would likely cause an epic meltdown. As nervous as I was for my session, I was giving thanks that I had simple ingredients in front of me and a game plan for what I was going to cook. In this case, that was my Creamy Curry Hummus, Lemon Quinoa Salad with Sun-Dried Tomatoes & Pistachios and Southwestern Breakfast Quesadilla. 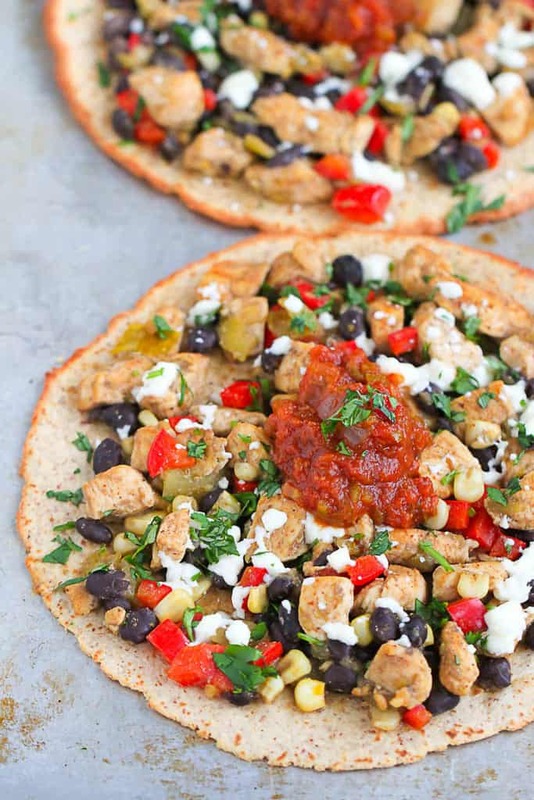 These tostadas are use ingredients that are found in my fridge and pantry on a daily basis…chicken, black beans, whole wheat tortillas. It’s quick and easy to pull together, making this a go-to recipe for those weeknights when you just don’t have the time or inclination to tackle anything more complicated. Unlike traditional fried tostadas, the tortillas in this recipes are crisped under the broiler. Take care to set the broiler rack at the second-highest level so that the tortillas don’t burn. The nutritional information is calculated using the carb balance whole wheat tortillas by Mission (fajita-sized), and each one contains 9 grams of fiber. That’s a lot of fiber in one little tortilla! The topping is packed with traditional southwestern flavors, such as cumin and cilantro. Feel free to mix up the spices or the vegetable combination to suit your family’s taste buds. Preheat the broiler. Place the rack at the second-highest position. Place the chicken pieces in a medium bowl and toss with the chili powder, cumin, salt and pepper. Heat the canola oil in a large nonstick skillet set over medium-high heat. Add the chicken and cook, stirring occasionally, until the chicken is starting to brown, 3 minutes. Add the black beans, red bell pepper and corn. Cook until the chicken is cooked through, about 1 minute. Stir in the diced green chiles and lime juice. 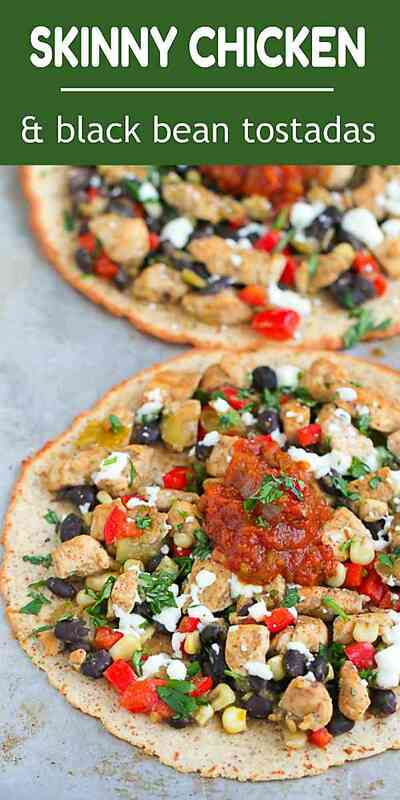 Place 2 whole wheat tortillas on a large baking sheet and lightly coat each side of the tortillas with cooking spray. Broil for 2 minutes, then flip the tortillas and broil for 1 more minute. Spread 1 cup of the chicken mixture on each browned tortilla and top each with 1 1/2 tablespoons queso fresco. Broil for 1 minute. Garnish with cilantro and salsa. Serve. Repeat with the remaining tortillas, chicken mixture, queso fresco, cilantro and salsa. Spread 1 cup of the chicken mixture on each browned tortilla and top each with 1½ tablespoons queso fresco. Broil for 1 minute. Garnish with cilantro and salsa. Serve. I love that show “Chopped!” But, I am glad you did not have to be a part of those crazy ingredients! I would have died. I am so all about this tostada right now! 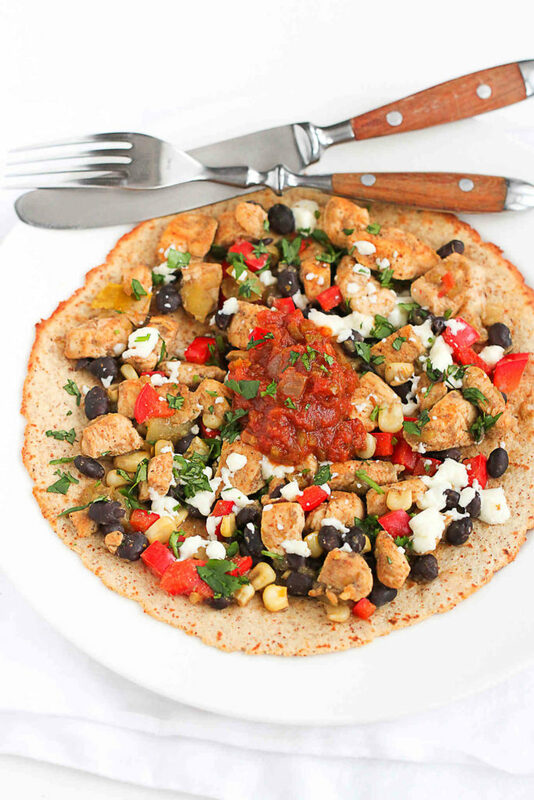 Love the crispy tortilla with creamy cheese, salsa and all those healthy beans and chicken. Yum-o-rama! Thanks, Taylor! “Chopped” is always fun to watch, but I’m was so thankful not to be a part of that particular competition. You had me at queso fresco!! BTW I just referred your running article to a friend who wants to start. She loved it!! Thank you so much, Liz! I’m so excited to have another person join in on the challenge. My husband eats Mexican inspired food daily at our house. I have a very similar recipe with low fat ground beef instead of chicken. Always a favorite! 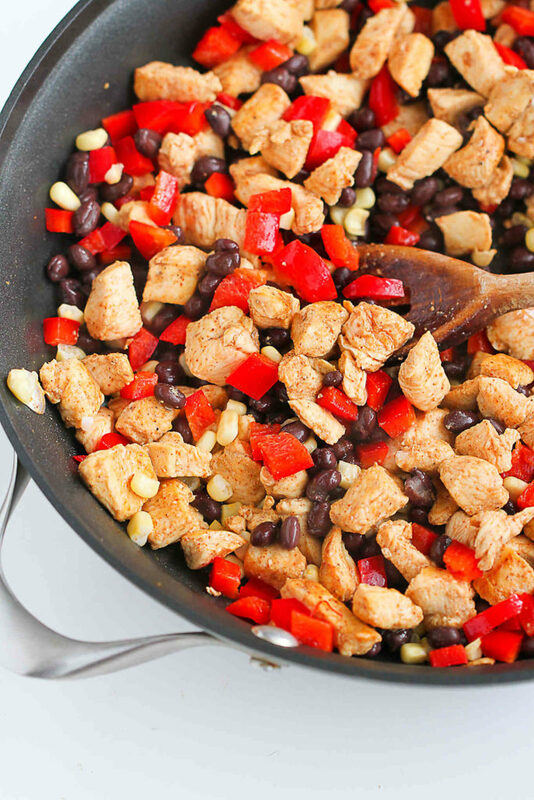 I considered making this one with ground turkey…now I know that I need to try that for certain. Thanks, Kirsten! This looks like just the thing to beat the January “blahs” and dream of Mexican sunshine at the same time. Thanks for sharing. Totally making these…they sound delicious and the whole family loves tostadas! I’m so glad you gave the tip about the broiler for those tortillas. I bought the same ones last week and tried to make pizzas on them. They were a little chewy….still edible, but not as crispy as I would like. Broiler it is! Thank you, Bridget! The broiler really does to the trick…the tortillas get a little crispy without too much effort. And now you’ve got me thinking about pizza! I’ve never tried queso fresco yet. I noticed it at a store recently. I’ll have to pick it up and give it a try with these tostadas. They look yummy! Thanks, Melanie. Queso fresco is a firm cheese that crumbles easily. It’s a great low-fat alternative to a pile of Monterey Jack or cheddar cheese. I can’t even imagine being faced with tilapia, melon and licorice. I’d excuse myself to use the restroom and never go back LOL. This tostado looks fantastic! I love how fresh it sounds and looks!! Great tip on the broiler! LOL. That would be my reaction, too! Another lovely recipe, Dara. Thank you and Happy Monday. Thank you, Liz. Have a great day! Just the color of these tostadas makes me want one. Tilapia, melon and licorice? Wow that would be a hard basket. I love that show. Thank you, Lisa! And yes, doesn’t that basket sound horrifying?! The color and flavor of these is just amazing. My whole family would ask for these weekly and that is not something that happens with many foods! I love everything about this tostada! Love all of the color and flavor in these tostadas! You had me at tostadas! I could eat this up with my eyes alone! Making tomorrow night! Again, you’ve bowled me over. This looks incredible I know why you’re so good at Mexican and you’ve really influenced my repertoire in that direction. Love it! Just wondering if you used flour tortillas or corn? Hi Laura, the whole wheat tortillas are made from flour. That being said, I think this would work just as well with corn tortillas, which would be a great option if you are serving them to someone with a gluten intolerance of any kind.